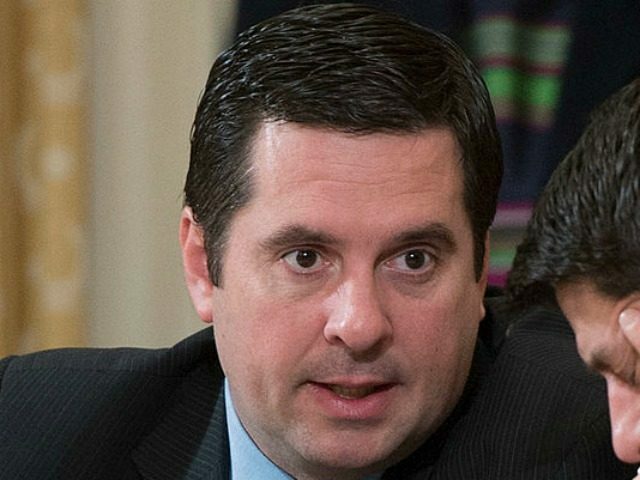 In an exclusive interview with Breitbart News, House Intelligence Committee chairman Devin Nunes (R-CA) spoke about the release on Saturday of the Democrats’ memo, saying that it confirms what the previously released GOP memo said. The memo supported the assertion that if any collusion took place with the Russians during the 2016 presidential election, it was with the Democratic Party and the Hillary Clinton campaign. Breitbart News asked Nunes about the release of the memo on the same day he attended the American Conservative Union’s Conservative Political Action Conference outside of Washington, DC, where he received the Defender of Freedom award. Nunes said he welcomed the release of the Democrat’s memo. Nunes also said that Congress can do only so much once the facts are out, and that it is up to the executive branch to take enforcement actions. Breitbart News asked Nunes whether or not anything in what’s been made public points to collusion with the Russians during the 2016 presidential campaign. “We’ve only seen collusion between the Democratic Party, the Hillary campaign, and the Russians,” Nunes said. “We have no evidence of the Trump campaign colluded with Russia,” he added. Nunes expressed determination to see this investigation through. “The American people and all of Congress deserve to know the truth,” Nunes said.